Anyone who has been in the security industry since the ‘good old days’ of analogue everywhere, probably rolls their eyes and has a few choice words to say when they hear people talking about IP and open standards. Unfortunately, or more accurately, fortunately, IP and open standards have taken the security technology world to a new level where proprietary systems and customer lock-in are no longer the global standard. Of course, IP and openness have also brought their challenges as there are new skills to be learned and new competitors from the IT world. And it has made certain customer interactions difficult as some may insist on analogue as the way to go as ‘it just works’. This article won’t discuss the pros and cons of analogue vs. IP, but we will focus on what many people have ignored in the past, the good old intercom. Intercoms are nothing new, in fact, many people have a type of intercom on their front door. What is new is the move to IP intercoms and the additional value-add these devices offer organisations and even residential estates. IP intercoms not only offer voice capabilities, but also video as well as the ability to integrate to other access and security technologies. • Anita Hermaans, sales consultant at Elvey. • Daniel Chau, overseas marketing director, Dahua. • Lauren Sher, regional manager – Johannesburg and sub-Saharan Africa, TOA Electronics Southern Africa. • Riccardo Battaini, MD of Came BPT SA. Hi-Tech Security Solutions: What new features and functionality do IP intercoms deliver to users that takes them a step ahead of traditional intercom systems? Hermaans: Fermax LYNX is an advanced TCP/IP system that provides state-of-the-art management of communication, security with simplicity. Special features include communication between apartments, message service, event recording, protection using CCTV cameras and lift control, to name a few. Chau: IP intercoms have better video quality, which gives users a better experience. Compared with traditional intercoms, IP intercoms have larger system capacity to satisfy big project requirements. When combined with CCTV surveillance, access control and alarms, IP intercoms can offer full solutions for buildings and communities. Software customisation is also more flexible in IP intercoms. Sher: With the huge drive to having all suburbs running on fibre, it makes the installation quicker and easier. The integration with other technology becomes seamless. Running on fibre also gives better stability to the line and is less conducive to lightning strikes. Battaini: When the system is connected to the Internet and can use the Came cloud service, it is possible to receive video intercom calls from all the entry panels to the user’s mobile device (smartphone or tablet) wherever the user is in the world. In the other direction, the user’s mobile device can be used to control the property (or properties) remotely using a simple app. Hi-Tech Security Solutions: Seeing that these systems are IP based, does that mean they are open to be integrated with other systems, such as alarms or surveillance? What standards are common in IP intercom systems? Hermaans: LYNX provides users freedom of choice through existing technologies (SIP, ONVIF, etc.) and home automation systems. The system generates synergies through unlimited solutions supporting the integration, interaction and compatibility with other systems. LYNX has broken down all technology barriers because this system, based on TCP/IP protocols, lets you manage all communication, security and comfort aspects of a project simultaneously. Chau: SIP is an open and standard protocol in intercoms which is popular all over the world. Dahua IP intercoms support the standard SIP (2.0) protocol. Third-party SIP devices such as SIP phones can be easily integrated in the same system. Both outdoor stations and indoor monitors can add IP cameras through the ONVIF protocol. Sher: We supply both an IP and SIP system and the two can also be integrated. The IP system has an encrypted protocol providing strong security whereas SIP is a far more flexible protocol which allows you to integrate with other platforms seamlessly. We do have a gateway for our IP-based system should integration be required. The TOA intercom systems can also be integrated via a variety of SIP servers such as Genetec, Cisco, Avaya and Asterisk. Battaini: The IP360 system is designed using a standard communication protocol called SIP (Session Initiation Protocol) and therefore it is compatible with most third-party devices which use the same. We have successfully integrated our IP intercom with third-party SIP handsets, PABX systems as well as home automation products. The 7-inch video IP monitor, the Futura IP, also has the ability to display almost any IP CCTV camera from any manufacturer using the same kind of protocol and is ONVIF compliant. application which allows you to connect and control all the devices installed, including the automation of gates, doors, access control through turnstiles and the home automation system. Hi-Tech Security Solutions: Many IP intercom systems are able to be managed via a smartphone. What mobile features do you offer? Hermaans: By incorporating a LYNX router in any installation (single home or apartment building) and downloading the LYNXed app (available for iOS and Android), calls received at the door entry panel can be diverted to mobile devices where the user can see, communicate and open the door/gate from anywhere in the world. Chau: All Dahua IP intercoms support smartphone apps. Users can receive calls from visitors and have bi-directional conversations, remotely unlock doors, and monitor via the app. Snapshot, video recording and information logs are also supported on smartphones. Battaini: The IP360 video intercom system is perfectly suited for both single-unit or multi-unit systems by simply adding more handsets or monitors. Each residential unit has the capability of having multiple Futura IP video monitors as well as mobile handsets connected to the same call button and will be able to receive video calls remotely. Hi-Tech Security Solutions: We’ve all had the experience of trying to communicate via an intercom and being unable to clearly hear the other side. What options and solutions are there to avoid poor audio quality? Are there standards or proprietary solutions to improve communication quality? Hermaans: Fermax intercoms have no issues with clear communication. Even in our standard analogue intercom system, the amplifier in all panels includes volume control so the user can obtain optimum volume. Chau: A better installation can avoid noise. For example, do not put outdoor stations and indoor monitors too close or the device’s MIC will be blocked. The network environment, such as wiring distance and cable quality, also affect voice quality. Sher: In order to ensure clarity when using an intercom system it is necessary to ensure that the quality of the components used in the manufacturing of the intercom are of a very high standard. You also need to make sure that there is AEC (Automatic Echo Cancellation) as this blocks out all the background noise. Another feature that our systems provide is automatic ambience noise control which increases and decreases the volume of the system in accordance with the ambient noise levels (as they change) – this is very useful in areas such as factories, airports, railway stations and other noisy areas. Battaini: A lot of effort has been put in place to improve the audio quality of the IP360 system. The system offers BPT quality clear communication which is managed by its onboard echo cancellation software. Both the microphone as well as the speaker volume can be adjusted very easily via a web browser, therefore eliminating the need for an installer to be on site. Hi-Tech Security Solutions: Is wireless networking a reliable transmission medium for an intercom given that Wi-Fi will be the normal mechanism used and not more reliable wireless technologies? Hermaans: We have to admit that with wireless networking there are always security loopholes. All you need is a good system administrator to make it reliable. From an intercom and business perspective, we see it as an opportunity and there are lots of benefits for all: users can move around freely with their handheld devices, installers not having to lay lots of different types of cables, advantage in terms of time and expense, and also, wireless networks can sometimes handle a larger amount of users. Sher: Yes it is a reliable transmission method, but you have to remember that weather conditions will play a significant role, as well as the network coverage in an area. Battaini: With a decent band (or by respecting the bandwidth required by the system), we can take advantage of a local Wi-Fi connection to produce fluent and clear video and communication. We have used very simple Wi-Fi routers and had very good results. Hi-Tech Security Solutions: If not answered above, what IP intercom products and solutions are you going to be releasing in the coming year? Sher: We have just released our SIP system to the market. 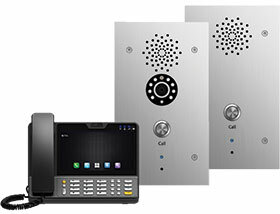 We now also have an 8-way exchange for our IP intercom system which is more cost effective for smaller projects. Furthermore, TOA now has an IP-based system, as well as a 2-wire system, a 2-core shielded cable system and a very cost-effective 4-wire system and all have IP capability. The biggest advantage is that there are many old TOA systems, some dating back more than 30 years and with these new systems it is possible to replace the existing installations without replacing the cabling. This is a huge advantage as many large existing systems in hospitals and prisons can be replaced quickly and cost effectively. Furthermore, CCTV systems, public address systems, voice alarm systems, access control systems and telephone systems can be integrated with the intercom systems by adding the optional interface units. Battaini: We already have a complete solution with full IP and PoE entry panels and monitors. During the coming year Came BPT is planning to introduce several new products in the IP360 range: a completely new range of entry panels called MTM, a wider range of IP monitors, an entry level IP audio receiver and an interesting solution with a Wi-Fi monitor for retrofit applications.